We have a crispy beef taco recipe that we absolutely adore, so much so that we purposely make the full recipe — even though it yields way more than enough for a two-person Taco Night — just so that we will have leftovers. The question is what to do with the extra taco meat. More tacos are good, easy and convenient. Nachos are a delicious and fun dinnertime alternative. And of course, there is the casserole — a layered, catch-all medium for transforming leftover protein into a one-dish wonder complete with pasta (or some other starch) and melted cheesy goodness. Channeling the (literal) king of all casseroles, king ranch chicken, and taking a nod from its East Coast casserole cousin, Johnny Marzetti — we adapted this recipe that uses tortilla chips for crunch and refried beans for a creamy layer and added enchilada sauce for extra Tex-Mex flavor and pasta to help bind it all together. We love the end-result casserole as much as (if not more than!) the original beef tacos and can pretty much guarantee that a “Taco Mac Night” will follow most of our Taco Nights from here on out. Start by cooking the pasta in a pot of salted boiling water until the pasta is just al dente. Be careful not to over-cook the pasta, since it will cook a little more in the oven once it’s added to the casserole. Build the casserole in a glass baking dish, starting with a layer of tortilla shells, broken into big pieces. You could use tortilla chips instead, but we always have taco shells leftover after Taco Night, so we put them to good use in the casserole. Add a thin layer of bean dip on top of the taco shells, using a fork or spoon to smooth out the beans. If the layer of beans is too thick (like ours in the above pic), the bottom of the casserole won’t have as much crunch after it comes out of the oven. When the pasta is al dente, drain it and mix it together with the leftover taco meat and a can of enchilada sauce. Add a layer of the pasta mixture on top of the beans in the baking dish. Next add a layer of cheese. Repeat the layers another time: taco shells, beans, pasta mixture and cheese. Bake the casserole, uncovered, in the oven preheated to 375 degrees until the cheese is melted and bubbly and the dish is heated through — about 10-15 minutes. Not only does this recipe incorporate leftover taco meat and shells, but you can also use leftover taco garnishes (lettuce, tomato, onion, jalapeno, sour cream, etc.) to top the finished casserole. Garnish the casserole with condiments of your choice and serve. Resisting the urge to name the evening after this dish is futile — Taco Mac is that good! Cook the pasta in a pot of salted water until just al dente. Drain the pasta and mix it together with the taco meat and enchilada sauce. Build the casserole in a glass baking dish, starting with a layer of taco shells. Add a thin, even layer of beans, then add a layer of the pasta mixture, followed by a layer of cheese. 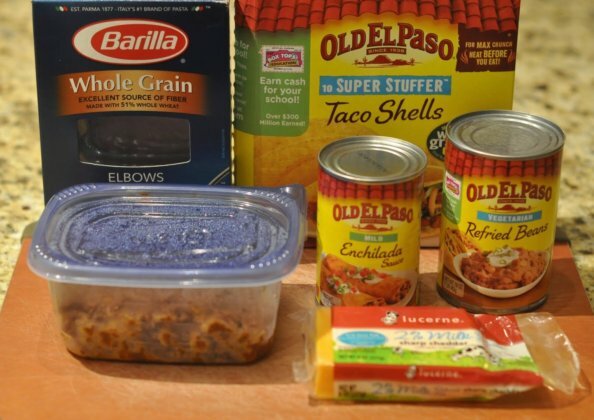 Repeat the layers another time: taco shells, beans, pasta mixture, and cheese. Bake the casserole in the oven preheated to 375 degrees until the cheese is melted and bubbly and the dish is heated through — about 10-15 minutes. Top with taco garnishes and serve. Jan24 I always eat taco salad cold if I use meat, I may or may not heat it up. Chicken I eat cold, gruond beef I would warm. But everything else I leave cold. Beans, cheese, corn, green onions, lettuce, tomato and usually chicken for us, dressed with catalina dressing. BUT, when I make an extra one to take for lunch, I put the lettuce closer to the top, and the other stuff closer to the bottom so my lettuce doesn’t get soggy or wilty and mix it up well when it’s time to eat it and save the dressing on the side for eating time. Yum, taco salad is actually on the menu tonight and planned for leftover lunch tomorrow! Great idea to layer the leftover taco salad with the lettuce close to the top! Now I’m craving taco salad!